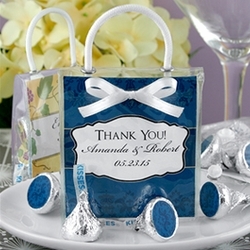 Personalized Hershey Kisses make the perfect Party Favor! Your guests will be delighted when they receive these awesomely delicious little Hershey kisses. They are beautifully presented in a petite clear gift tote. Great for any occasion! With a personalized card from you, and packed with eight coordinating Hershey Kisses, your guests may not be able to wait until the end to dig in! Our Hershey gift totes are easy to assemble (ribbon not included), with personalized card and pre-labeled Kisses.